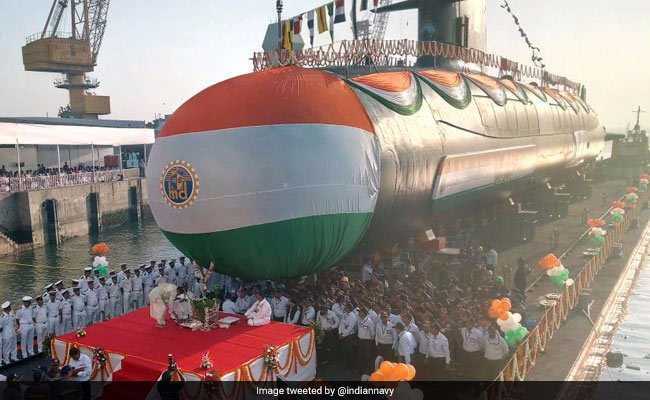 Indian Navy launches the state-of-the-art third Scorpene class submarine, Karanj, which is made-in-India hunter-killer submarine. It has superior stealth features and the ability to launch crippling attacks with precision. Indian Navy launched the third Scorpene class submarine, Karanj in Mumbai. Mumbai: Indian Navy launches the state-of-the-art third Scorpene class submarine, Karanj, which is made-in-India hunter-killer submarine. It has superior stealth features and the ability to launch crippling attacks with precision. Scorpene-classs submarine Karanj was launched at the Mazagaon Dock Shipbuilders Ltd (MDL) on Wednesday morning by Reena Lanba, wife of the Indian Navy chief, Admiral Sunil Lanba. It is third indigenously-built diesel-electric attack submarine after INS Kalvari and INS Khandari. The previous INS Karanj had served the nation for 34 years from 1969 to 2003 and had also participated in the 1971 war. Scorpene-class submarine Karanj is loaded with superior stealth features such as advanced acoustic silencing techniques, low radiated noise levels, hydro-dynamically optimised shape and the ability to launch a crippling attack on the enemy using precision guided weapons. The attack by INS Karanj can be launched with both torpedoes and tube launched anti-ship missiles, whilst underwater or on surface. The stealth of this potent platform is enhanced by the special attention given to various signatures. These stealth features give it invulnerability, unmatched by most submarines. Admiral Lanba said that the launch of INS Karanj marked a significant departure from the manning and training philosophy that was adopted for the first two submarines, adding that "from the present vessel onwards, the Navy would be fully self-reliant in the training and certification processes." Scorpene submarines can undertake a wide range of missions such as anti-surface and anti-submarine warfare, intelligence gathering, mine-laying and area surveillance. The INS Karanj submarine is designed to operate in all theatres, with means provided to ensure inter-operability with other components of a Naval Task Force. The submarine INS Karanj has been designed by French naval defence company DCNS. Another three Scorpenes, being built under a Transfer-of-Technology contract, are in the pipeline. Apart from this, a sophisticated and state-of-the-art Shore Integration Facility has been developed at MDL for integration and simulation of various equipment of the Scorpene submarine combat system for which there was no facility available in the country. The Scorpene deal was signed for India in October 2015 and the first submarine was due to be delivered by 2012. Last year, INS Kalvari, the first Scorpene class submarine was commissioned into the Indian Navy, at a ceremony on 14 December, by Prime Minister Narendra Modi. Khanderi, the second Scorpene class submarine was launched in January 2017, and is currently undergoing the rigorous phase of sea trials and is also scheduled to be delivered shortly.